Cristin has been educated from Vidal Sassoon Los Angeles to New York Cities Bumble and Bumble working in both uptown and downtown salons mastering in painting since 2004. As a colorist and educator at renowned Bumble and Bumble she collaborated in the launch of Bumble and Bumble University Color Workshops which have shaped the art of hair painting as we now know it today. Currently she is the Eugene Perma Professional West Coast Brand Educator and founder of BBLA. Eugene Perma Paris were established in 1918 as a French, independent, owner-managed company that has been exclusively dedicated to the beauty of hair for nearly 100 years Eugene Perma also enjoys an international presence, as it operates in over 56 countries located around the world. It has a strong presence in Europe, with its main subsidiary located in Barcelona, Spain. Eugene Perma prioritizes the use of plant or marine origin active ingredients. No animal-origin active ingredients are used in their products and have been a forerunner in putting an end to animal testing since the 1980s. All products are dermatologist tested. 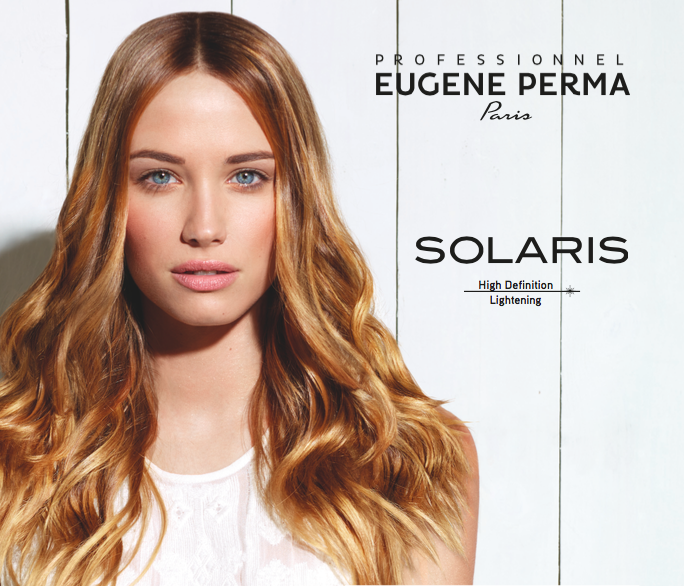 Solaris is a range of 6 ultra-high-tech products that provides solutions for all lightening techniques. It perfectly meets the needs of colorists with a formula developed to ensure maximum respect for the hair and the stylist. HUIL4: Lightening oil for lifting up to 4 levels. POUDR7: Compact powerful bleaching powder for intense lifting up to 7 levels. CREM5: Lightening cream for lifting up to 5 levels. POUDR6: Compact "open air" lightening powder for open air highlights, provides lifting up to 6 levels. DEMAQ: Compact oxidative hair color remover. LAIT: Post-hair color neutralizing lotion to effectively neutralize alkaline residue. The excellence and color expertise of CARMEN is now available in CARMEN TON SUR TON demi permanent hair color. Backed by the innovative REFLECT MAGNETIQ SYSTEM inspired by the diffraction of light, and formulated without ammonia, CARMEN TON SUR TON offers a multitude of possibilities to meet every color need in salons through 4 customized services: DEMI PERMANENT SERVICE, GLOSS SERVICE, TONER SERVICE, MEN'S SERVICE. CARMEN TON SUR TON offers intense, luminous nuances and extreme shine with no visible root regrowth* or commitment. Choose color excellence with CARMEN, the 1st permanent hair color that enhances tones and shine. A major industry player for more than 20 years, CARMEN features the benefits of the Reflect Magnetiq System and is available in 109 shades.